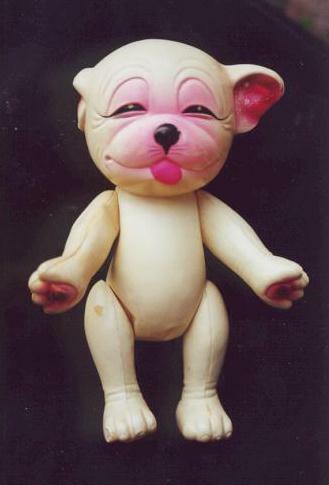 Bonzo appeared in many varieties of celluloid styles, colours, shapes, sizes and poses as can be seen from these examples here. Many were Japanese or German made. They all seem to date from around the 1930's era. 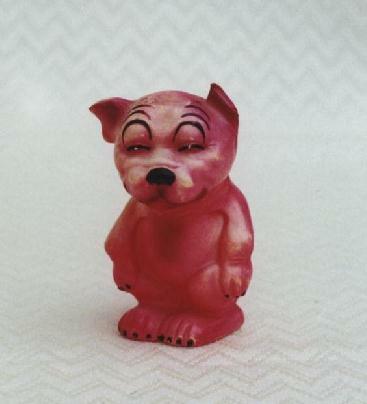 This pink Japanese one has moveable, strung limbs and is about 4 inches tall. 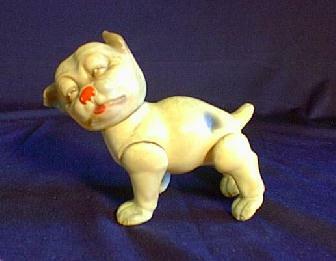 This example is American, having the 'VCO' maker's mark stamped on him. His limbs are moveable, and he stands about 4 inches tall. 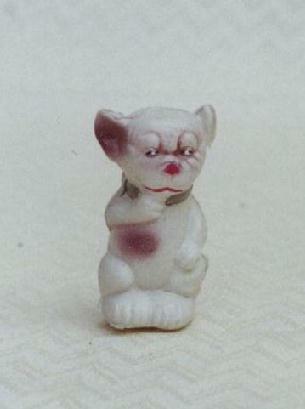 This tiny Japanese one is a hollow single piece mould with no moving parts. He's only 1½ inches tall! This German example was made by the Juno company. 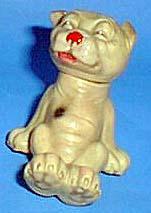 He has a moveable head, but is otherwise unjointed. He stands 2½ inches tall. Here you can see the elastic string that holds the limbs into the body. In this one's case they have suffered from age and have stretched somewhat. 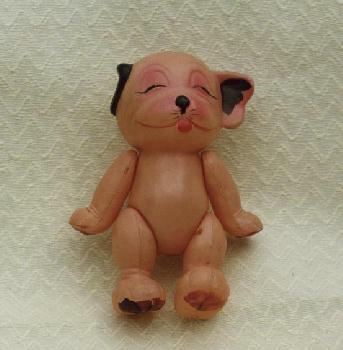 This one is about 1½ inches tall. 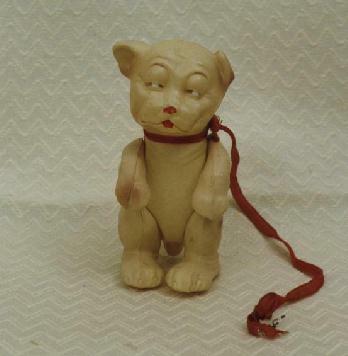 This German one is mounted onto a small wooden base. Only the head moves, and with the base stands 3¼ inches tall. A somewhat different German Bonzo, almost feminine in its painting. With the limbs all jointed, it stands 6¾ inches tall. 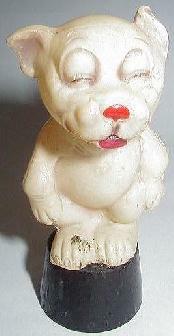 This German one is made in a more dog-like image, standing on all fours. 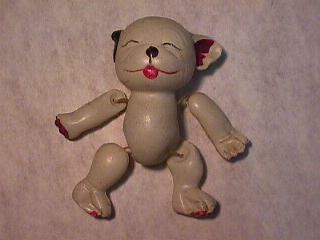 The limbs and head are moveable, and it is about 4 inches long. Only the arms are moveable on this version, but the mould and colour scheme is quite different from the usual Japanese versions. He stands about 3¾ inches tall. 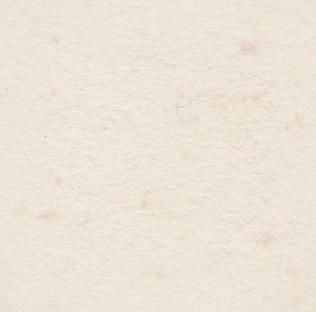 This laying back version is German, with Juno the maker's paper label on the back. Only the head moves on this chap. 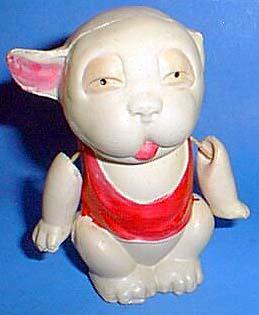 This little chap is seated on a celluloid sled, all ready for Christmas! 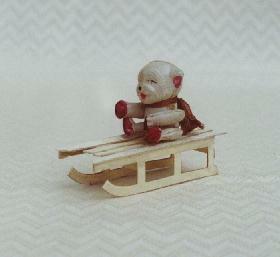 The limbs are again flexible, though the hind legs are glued to the sled. It's about 2¾ inches long and 1¾ inches tall on it's sled. A real cute one! 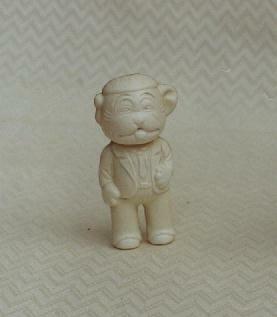 This Bonzo looks as if he's dressed for a night out. 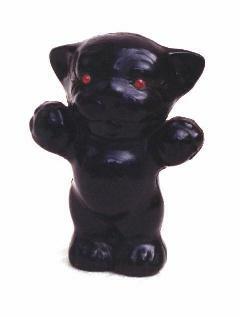 He's made of filled celluloid, so is more solid, and stands 3 inches tall. Another unusual filled celluloid Bonzo, this time in black. 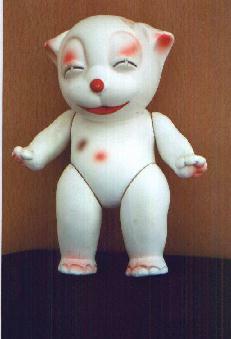 He is again Japanese, and he has small plastic jewelled eyes. He stands just over 3 inches tall. This huge Japanese one stands a masive 8½ inches tall! As with most, the limbs are moveable.